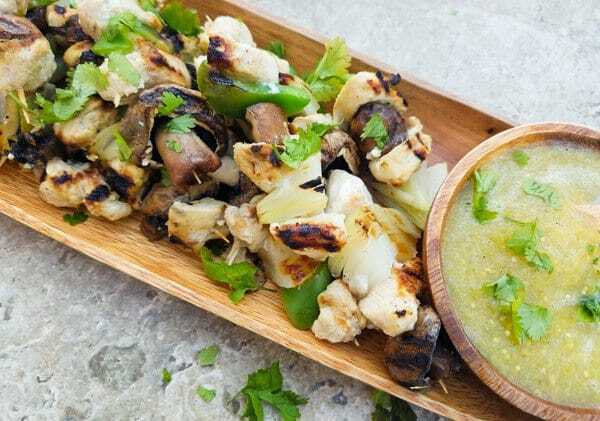 Mini Serrano Chicken Kabobs | Mexican Appetizers and More! Today I made these Mini Serrano Chicken Kabobs. And boy were they yummy!! I wanted to make something healthy, tasty and spicy. Well this little Mexican appetizer hit it out of the ballpark! I added some crimini mushrooms, onions and peppers (simple!) and marinated the chicken in a roasted tomatillo serrano sauce. As you may already know this is absolutely one of my favorite sauces and it works so well in this dish! And I only marinated the chicken for just an hour and these babies came out just fabulous! I would recommend marinating the chicken overnight for an even more delicious intense flavor but if you’re in a little bit of a rush and want to get to eating these little guys, feel free and marinate the chicken for an hour. 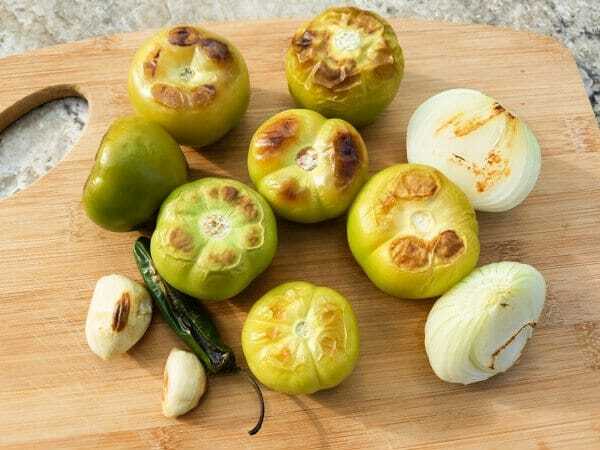 The best part of the roasted tomatillo serrano sauce (also known as salsa verde or green sauce) is you make a batch and then you have a bit left over for say Taco Night or Empanada night! Or maybe some chicken sopes or seafood sopes. This sauce is just wonderful and pairs up well with many dishes. Great on steak too! And for my foodie friends out there that like food just a tad hotter than most, just add another serrano pepper to the sauce. I normally add one to two serrano peppers to mine. If you have never had a serrano sauce of any kind, maybe start with adding half of a serrano pepper to the blender and then if that’s not enough heat, add the other half and continue to add and taste until you find your right heat level. 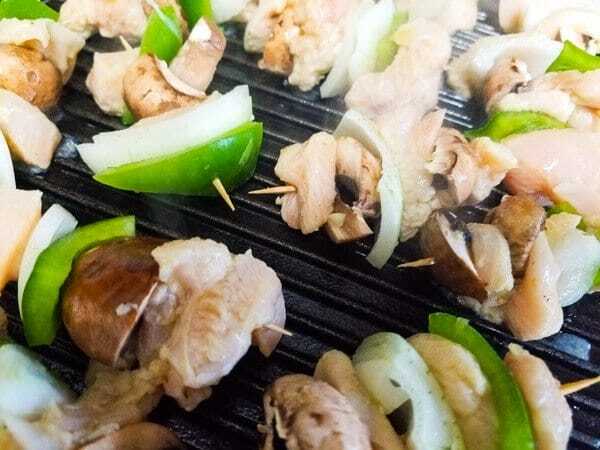 I think I’m going to make these mini serrano chicken kabobs in 2 weeks for a gathering I’m having. I have been putting a list together of all the Mexican Appetizers I want to serve and this one certainly made the list! It’s super easy, a no fuss appetizer and delicious. Maybe you guys could help me pick some from my list of Mexican appetizers that you have enjoyed from here, my humble little blog. Mini Serrano Chicken Kabobs served on a wooden platter with tomatillo serrano sauce beside it. Preheat oven to 375 degrees. Remove husks from tomatillos. 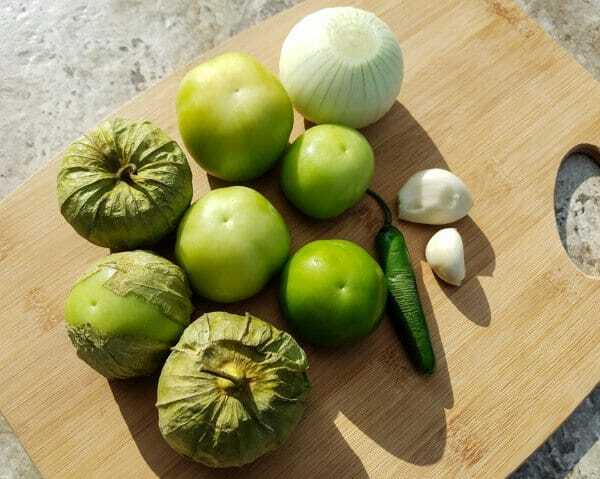 Once husks are removed, rinse tomatillos under warm water. Rinse serrano pepper as well. Peel onion and garlic. Place all on a baking tray. Roast all vegetables in oven at 375 degrees for 20 min. Once vegetables have roasted, remove stem from serrano pepper. Add all veggies to a chopper or blender. Add the cup of chicken broth or water (can exclude if you would like a thicker sauce). Blend until smooth. 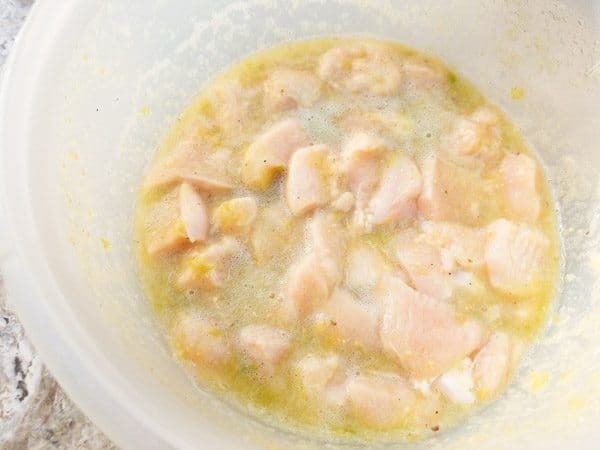 Rinse chicken breasts and cut any excess fat off. Cut breast into bite size pieces about 1 inch. 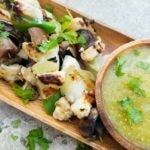 Place chicken in a bowl and add a 1/4 cup to a cup of tomatillo serrano sauce. Add salt and pepper to taste. Cover bowl with plastic wrap or aluminum foil and place in refrigerator for an hour to marinate or longer if you have the time. Cut green pepper and onion into 1 inch pieces. Slice mushrooms in half. Set aside. After chicken has marinated, discard marinade from bowl. Thread chicken and vegetables alternately onto skewers. Lightly oil a grill pan or cook directly on a grill. Cook for 10 to 15 minutes, flipping over every few minutes until chicken juices run clear. 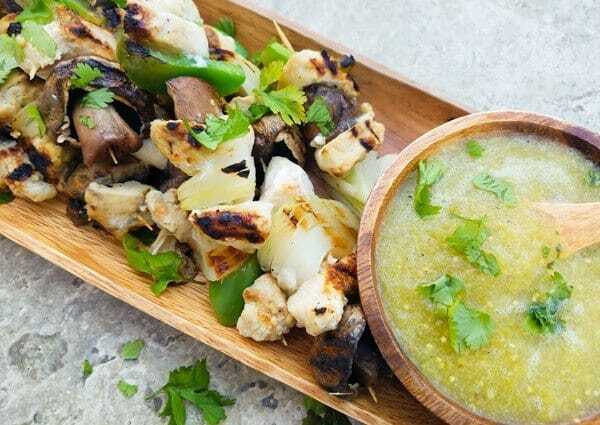 Serve kabobs on a platter with reserved tomatillo serrano sauce. Enjoy! Tomatillos with and without husks (husks removed) onion, garlic and serrano pepper. Chicken marinating in tomatillo serrano sauce. Mini Serrano Chicken Kabobs!! Yumminess!! Perfection!! Will you be making these mini serrano chicken kabobs anytime soon?